This cabin is nestled in the forest at the base of Mt. Howard. It is located on a private road served by only 3 other cabins. It has been recently remodeled with many new features! There is woodwork throughout, a nice wood stove, new flooring and new appliances. You will love this cabin's architecture, many amenities, and view of the mountains! You can enjoy sitting peacefully on the deck and watching the deer, birds, and chipmunks, or have a barbecue at the picnic table! 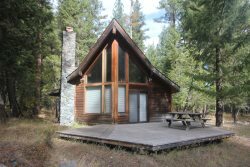 This cabin is just a short walk to the lake and most of the Wallowa Lake activities including mini golf, bumper boats, restaurants, and more! Come enjoy this little piece of heaven with the ones you love! You won't want to miss out on this great experience at Wallowa Lake! Only disappointments were the pots and pans sucked, and that we couldn't do the dishes until we went and got soap and a sponge. Plus, this review site is pretty lame as well - it doesn't provide the kind of information I would like to read as a customer. You need a free-form comment section, rather like Amazon has for their products. This site is clearly conceived as a propaganda tool for property owners and your company.